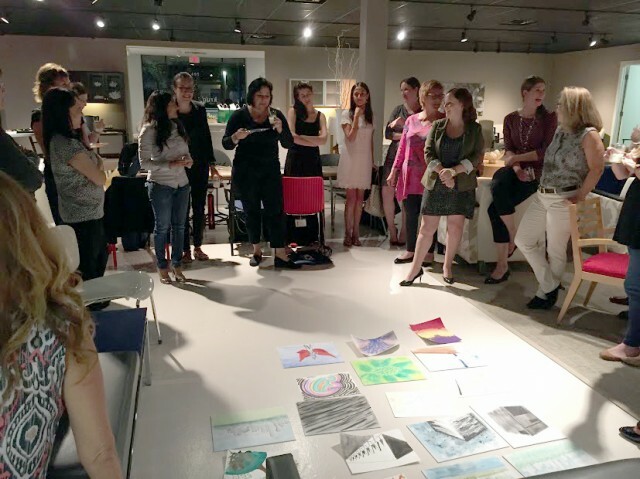 WiA hosted a sketch party/ happy hour combination in the Design District...here are the results! 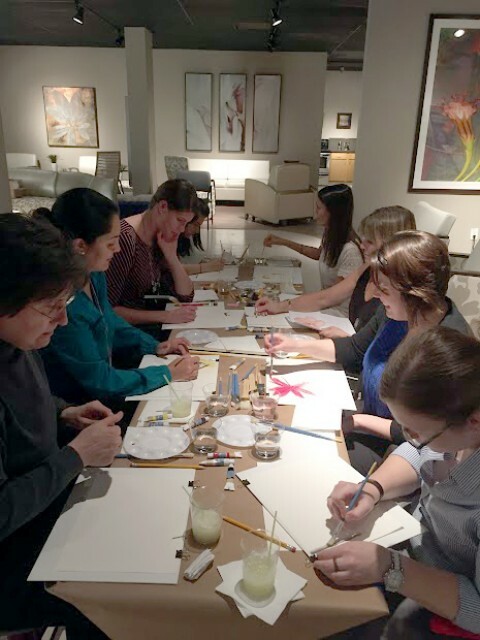 For our September happy hour, the AIA Dallas Women in Architecture hosted a special sketch party at the Ginger Grant Group. The designer furniture showroom perfectly set the tone for an evening of fun, fellowship, and excitement. 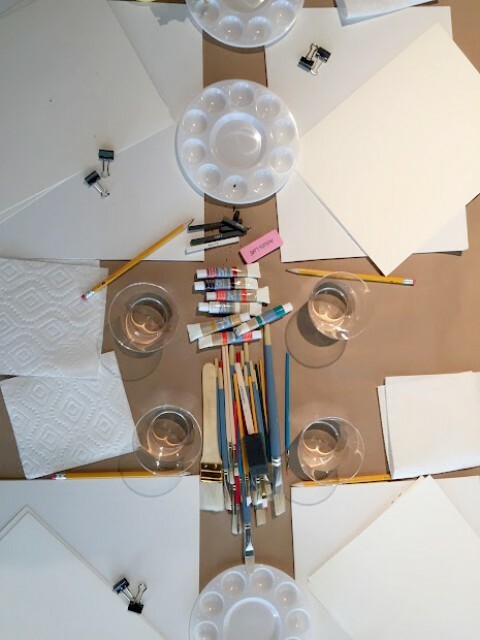 Our setup inlcuded tables covered with craft paper and supplied with materials for drawing and painting generously donated by Placement by Design. 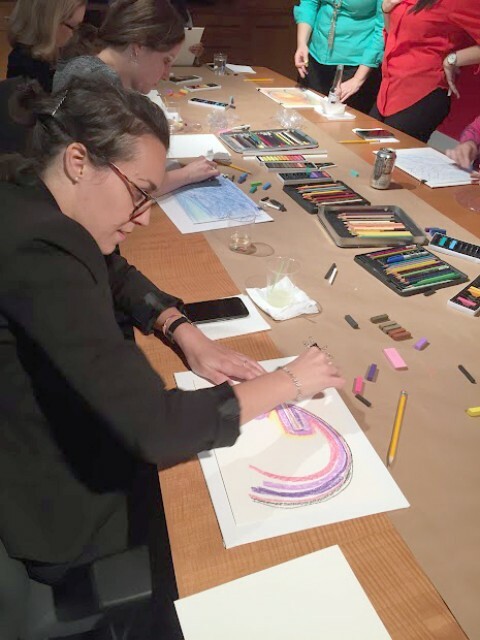 Another table had dry media of pastels, graphite, and colored pencils, while the other two had wet media of watercolors. Each seat had two sheets of watercolor paper and a watercolor canvas. The grand finale of the evening focused on the canvas. With a little more time for this last piece, everyone selected a photograph of a place in Dallas for inspiration. Approaches ranged from literal interpretation, to focusing on a small detail in the photograph, to playful abstraction. To complete the evening, everyone selected their favorite piece for all to enjoy collectively and for the judges to vote. Winning participants received a hand-crafted sketch book donated by Placement for Design and designed by Poonam Patel. 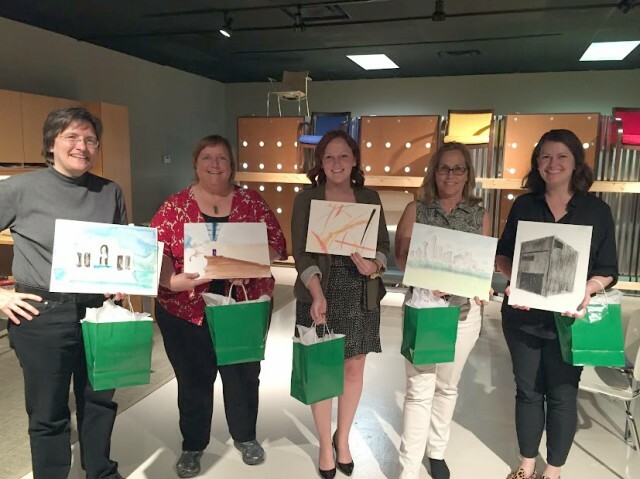 Ginger Grant Group hosted the happy hour and supplied drinks, and CSI made sure that everyone had a bag to tote their art pieces. Each sponsor’s support, as well as the hard work of Vince Tam, the committee, AIA Dallas staff, and others, made such a great evening possible.